Rest of Friday: Mix of sun and clouds, highs near 60. Friday Night: Increasing clouds. Lows in the 40s and 50s. Saturday: Mostly cloudy, spot shower. Highs in the 60s and 70s. Sunday: Mostly cloudy, spot shower. Muggy, breezy. Highs around 80. It was a frosty start to Friday, but temperatures did rebound nicely across the region under a blanket of plentiful sunshine. Clouds built in from the south and west Friday evening, with the extra cover helping to keep temperatures slightly warmer than Thursday night as lows only slip into the 50s south, upper 40s north. More humid air approaching the South Coast of New England Saturday morning will result in an expanding area of fog in far southern New England Saturday, further fortifying the stubborn deck of clouds for all of us with a few sprinkles and light showers falling from time to time as temperatures very slowly nudge toward 70. More clouds and some pockets of fog and drizzle Saturday night may be accompanied by a few showers pre-dawn Sunday as a final push of more substantial warmth arrives, delivering a strengthening southwest wind with gusts to 40 mph Sunday, breaking out some sun and boosting high temperatures to 80 degrees for some of us. The weekend will not be a washout, but hit or miss showers are possible both weekend days along with stubborn cloud cover. As far as the temperature trend, the warmth will be short-lived this time around, with a cold front crossing Sunday evening and night, delivering a slug of fall air with more staying power next week – from Monday all the way through the week – but with little moisture, mostly dry conditions should prevail for the vast majority of us next week in the exclusive Early Warning Weather 10-day. 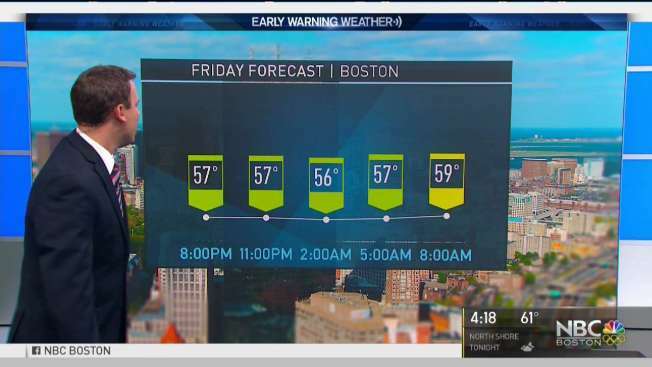 Stay up to date with the very latest changes to your forecast on-the-go with the NBC Boston and necn apps.